No. 10 seed Georgia State waited on the train that never came. After winning the first quarter 15-14, head coach Sharon Baldwin said the Panthers needed to be more aggressive. It didn’t happen– they fell 74-55 to No. 7 Coastal Carolina in the first round of the Sun Belt Conference tournament. Kierra Henry raced to 11 points in the first quarter. Then she went ice cold and Georgia State (8-22, 4-14) was out of the game. Henry didn’t score her next points until 7:17 left in the fourth quarter. Coastal Carolina outscored Georgia State 60-40 after the first quarter and led 36-21 at halftime. Henry scored a game-high 18 points on 5-13 shooting while Janessa Murphy and K.K. Williams added 15 and 13 points respectively. Poor defense was a season long derailment the derailment and was no different in the conference tournament. Coastal Carolina (17-13, 10-8) shot 46.4 percent from the floor and scored 34 points in the paint. 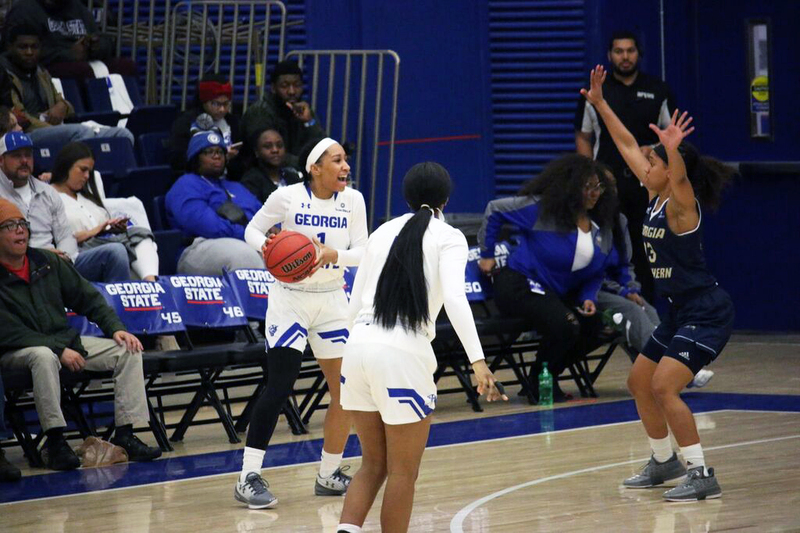 Jas Adams burned the Panthers with four three-pointers and 16 points. Kailyn West (15), Breelyn Blanding (13), Janae Camp (11) and Naheria Hamilton (10) also scored in double-figures for the Chanticleers. Georgia State has played without 2016-2017 Sun Belt Freshman of the Year, Jada Lewis since sustaining a season-ending leg injury on Nov. 11. She played just two games and has three years of eligibility remaining. Shay Fluker (13.9 pts) was the second leading scorer for players who appeared in 15 games or more. Her last was appearance was on Jan. 20, the sixth conference game of the season. All players from the 2017-2018 roster are returning next season because their were no seniors.